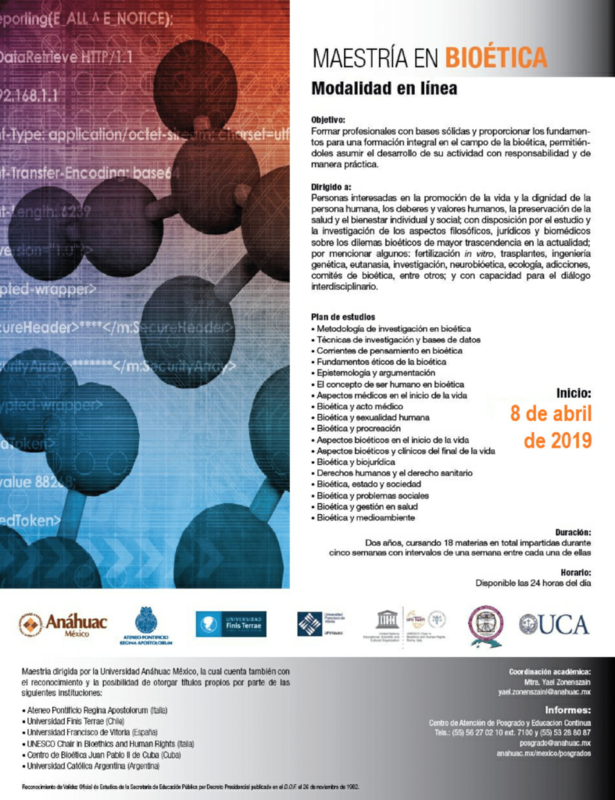 The UNESCO Chair in collaboration with Universidad Anahuac Mexico, is launching the 4th edition of the Inter-university and International Master in Bioethics on line, that will start on April 8, 2019. The articles in this issue were originally presented at the interdisciplinary research workshop “Navigating Impasses in Bioethics: End of Life, Disability, and Mental Illness,” held on December 8, 2017, at the Von Hügel Institute for Critical Catholic Inquiry (VHI) at St Edmund’s College, University of Cambridge. This workshop developed from a longstanding research project on contemporary understandings of illness and health and provided a unique setting to bring together different perspectives on the contentious debates on physician-assisted suicide for those suffering with mental health problems and disabilities. The topic is both controversial and timely: euthanasia, under the euphemistic name of Medical Assistance in Dying (MAiD), was legalized in Canada in 2017; the UK Parliament, after rejecting the Assisting Dying Bill in 2015, is currently debating a new proposed bill to enable terminally ill patients to receive assistance in dying; the number of Dutch cases of physician-assisted suicide on the grounds of psychiatric problems is rising slowly but steadily, while several other countries are revising the allocation of their resources dedicated to mental health care, exploring options for advance request and early consent, and extending the criteria for the granting of physician-assisted suicide. These articles explore both practical and theoretical aspects of the discussion and attempt to reimagine some of the key concepts involved, particularly the definitions of quality of life, dignity, autonomy, agency, consent, and mental capacity. It might come as a surprise that contributors have been drawn intentionally from very different academic fields with the aim of bringing together different aspects of reality but also to find and highlight underlining connections, and look at individual stories from several diverse perspectives—the religious, the legal, the ethical, and the medical. 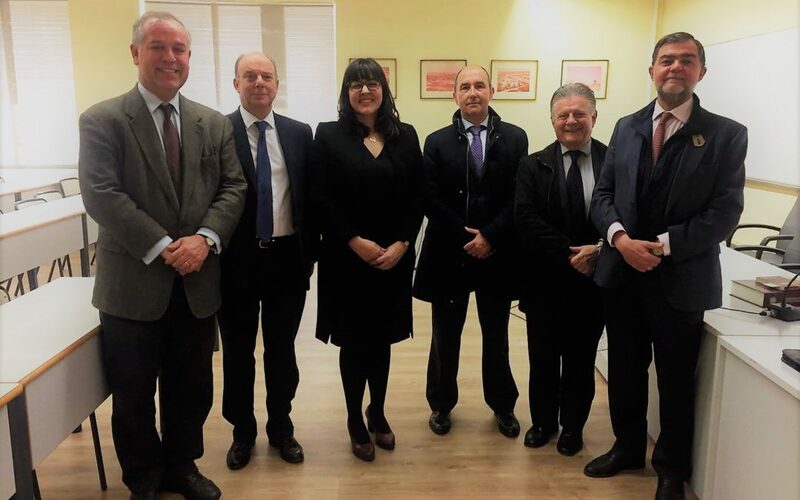 While the promotion and execution of this kind of multidisciplinary dialogue can be challenging, it is precisely this vision that animates the VHI, with its aim to address global contemporary challenges with ever-more-integrated ways of thinking as can be seen in the catholic traditions at their best. In a time when self-referential knowledge and the relentless specialization of academic fields often produces one-sided arguments and seemingly unsurmountable impasses and binary choices, it is essential to cultivate intellectually principled interdisciplinary and joined-up thinking. This approach can enable fresh and insightful conversations, as reflected in these articles, which have much to contribute to the public debate. The first two articles evaluate the implications of the laws legalizing physician-assisted suicide in the United States and Canada. Elizabeth Schiltz looks at the contradictory effects of the legalization of physician-assisted suicide for people with disabilities while at the same time promoting antidiscrimination laws. Looking at the Americans with Disabilities Act, Schiltz deconstructs the legal jargon to show how much the societal understanding of life with disabilities directly shapes the goals of the law. In a similar way, Thana de Campos considers the Canadian MAiD law with a focus on the ethical issues arising from the potential inclusion of mental health patients. As the current law only applies to competent adults, the issue of consent helps to build a case for a rejection of the conventional link between autonomy and human dignity, in favor of the recognition of an intrinsic value of dignity in all humans. The next articles broaden this discussion and bring in personal accounts and stories of disability in a compelling way. Patrick McKearney shares his experience as a carer at L’Arche, a religious community in which people with and without cognitive disabilities live together, and takes us on a journey to experience the significance of taking responsibility for someone else’s life. From examples of asceticism and early Christian martyrs to the context of British care homes, the burning question of “how much power should someone have over their life?” interconnects with modern assumptions about agency and the worth of people with cognitive disabilities. Elizabeth Finstein discusses the data gathered by the Future Care Study run by the End of Life Care Research Group at the University of Cambridge Department of Primary Care and Public Health. This study seeks to understand the preferred choices of those living with progressive neurological diseases and their families when it comes to managing the problems of nutrition and hydration at the end of life. Finstein brings in the resounding voices of patients as well as doctors, who are supposed to follow their patients’ wishes even when they lost the ability to understand the effects of different therapies, or wish to continue with a treatment that is no longer effective. The benefits and challenges of the practice of planning end of life care for people with cognitive disabilities are carefully evaluated in the light of the fragile balance between right to treatment and quality of life. David Jones turns to the difficult subject of suicide and highlights similarities and discrepancies between two stories of suicide committed by disabled people, one unassisted and one assisted. He forcefully argues for more attention to the danger of suicide and to the vulnerable position of ill and disabled people who wish to die and might be eligible for euthanasia in a different country. While different legal systems have the power to assist, encourage, or prevent suicide, greater guidance is needed to address the impact of the media reports of stigmatization or celebration of assisted suicide. Honest and positive accounts of lives lived with disability, which can make a real difference for suicide prevention, are still much to be desired. The last group of articles expand this already fertile terrain with philosophical and theological reflections on life and death for people with disabilities. Lidia Ripamonti looks at the concept of autonomy in dying and its unsuitability for those living with profound disabilities. The illusion of dying “in control” shapes the vision of a free and purposeful life, but to rediscover the worth of every life we must embrace dependency and challenge mainstream disability models. This perspective can help to unlock a notion of personal value based not on autonomy and self-determination, but rather on relational care and interdependence. Brian Brock reflects on how the current economic context shapes the social position of the disabled in our society. To live with a disability today means to be in a constant position of debt, something that our society fears and condemns. The early Christian formulation of human solidarity directly opposes the modern moral permissibility of ridding society of the disabled: the key question should therefore not be about our stand for or against euthanasia, but instead about what should be expected from a human life. Anthropologies undermining lives with disability are at the heart of the concluding article by David Elliot. Looking at the correlation between euthanasia and disability, Elliot opposes what he defines as “anthropologies of despair” and argues in favor of a hopeful portrayal of disabled life as it affirmed by disability rights organizations and Christian theologies. Theological hope strongly contrasts with the degrading criteria brought in by physician-assisted suicide and euthanasia, and offers a renewed understanding of disabled life through theological themes such as the image of God and the incarnation, the Christian art of dying, and the resurrection of the body. A final word of thanks should be said not only to the contributors for their expertise, time, and work, but also to the workshop participants and all those who encouraged and supported this project. 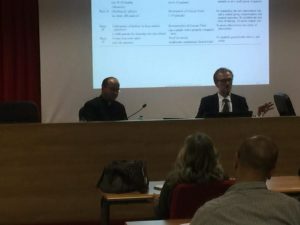 The event itself was jointly organized with the Terrence J. Murphy Institute for Catholic Thought, Law, and Public Policy, at the University of St. Thomas, Minnesota, with the collaboration of the UNESCO Chair in Bioethics and Human Rights, in Rome. We are especially grateful to the Directors of the Murphy Institute, Professor Elizabeth Schiltz, and Dr William Junker, for generously sponsoring the workshop and for their excellent support and enthusiasm. 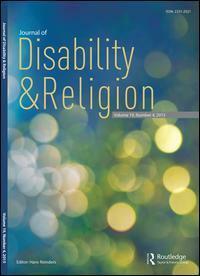 Finally, we are very grateful to Dr Brian Brock for his keen participation in this project from the start and for welcoming these articles for publication in the Journal of Disability and Religion. In this three-day event, the UNESCO Chair workshop will analyze and discuss “Protecting the Future Generations and the Ethics of Human Reproduction” from an Interreligious and Multicultural Perspective. Experts from religious (Buddhist, Christian, Confucian, Hindu, Islamic, Jewish) and secular traditions will discuss article 16 of the UNESCO Declaration on Bioethics and Human Rights: “The impact of life sciences of future generation, including on their genetic constitution should be give due regard.” Recent advances in reproductive technologies are having great impact on the creation of new families and affecting the roles of women. We have chosen Morocco for these conferences because its prestigious higher education academic multicultural and diverse population making this location attractive for experts in the field. The topics to be addressed will capture the attention and interest of health professionals, university scholars, the scientific community, researchers, media, politicians and the general public. We are confident that this next major UNESCO Chair endeavor gathering twenty-five experts in bioethics and other related disciplines from seven major cultural and religious perspectives will be help foster conversation and understanding among peoples from our globalized and religiously diverse world so in need of peace. The methodology of the workshop is found here. The ethics of artificial human reproduction (ART) is vast with many nuances and debates. While the papers could address areas in ART that are more particular to the religious tradition, we propose the papers to concentrate on the following guiding questions as they regard the more controversial areas that can affect the future generations and the nature of marriage, family and relationship with children. In the practice of IVF it is common for clinicians to perform prenatal testing (PNT) and preimplantation genetic diagnosis (PGD) as a means of selecting the genetically “healthier” embryos for in-utero implantation. Given the fact that neural tube disorders and genetic abnormalities can raise a host of spiritual and existential dilemmas, as well as explicitly ethical concerns, for the pregnant woman regarding her future child, to what extent should religious and spiritual and bioethical counseling be offered to women both during the process of obtaining consent for such testing, as well as during her deliberations regarding the results of such tests. Does PNT and PGD constitute a form of eugenics or is it an acceptable means of ensuring the health and flourishing of the future child/generation? Does PNT and PGD constitute of form of discrimination against future persons with genetic disabilities or lesser abilities because they are not enhanced? Does the act of genetically selecting embryos raise moral concerns regarding the relationship between generations? Is maternal surrogacy inherently a form of commodification for both the child as well as the mother, or can it be considered a virtuous (compassionate or selfless) act? How does the practice of maternal surrogacy affect the nature of motherhood, fatherhood, womanhood, childbearing and family? How does the practice of maternal surrogacy affect the future generation? Enclosed are further details about a Tentative schedule of these days. As means of dissemination, publicity and involvement of multiple and diverse scientific, medical and university communities and the public, we suggest holding in coordination with Fondation Cultures du Monde and the Association Fès Saiss an event open to the public on topics related to bioethics issues in the light of human rights in a multicultural and interreligious environment. “Come To My Home” is a scientific, cultural and artistic endeavor, initiated by Mr. Driss Allaoui, former Secretary in Morocco and a prominent active figure in Moroccan society. Its mission is to mix and make interact art, cultures and different citizenships. The workshop will be held in Casablanca, the precise location will be announced. Enclosed are further details about the Invited Presenters. For those who would like to join us in this event, please contact us at info@unescobiochair.org for logistical details regarding hotel, meals, transport, etc. Expenses are not covered by our organization. We are looking into possible cultural visits with a travel agency around the dates of the workshop. Luciano Bissolotti, physician and rehabilitation specialist, responsible for the recovery and functional rehabilitation service of the “Domus Salutis” in Brescia, linked the theme of the humanization of the technique to the therapeutic-rehabilitative value of robotics, within the ethical question of relational change which new technology brings. This second lesson of the Masterclass in “Neurobioethics and Robo-ethics” explored access to health care connected to robotic application through a historical sequence of an evolutionary process of engineering, medical, informatics and technical innovation. “Biography and biology with a history and narration, and not simply matter”, through prof. Bissolotti’s words. 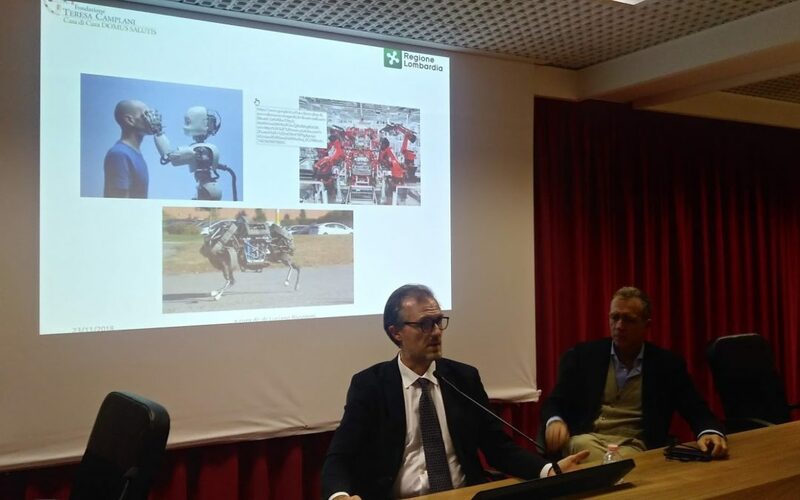 Recalling the etymological concept of the term “robot“, whose reference is to the word “robota“, refering to forced service or work, Bissolotti highlighted a fundamental aspect we must keep in mind when talking about robotics, which serves the human being: from the earliest origins, already around 1920, robotics’ main purpose was service, not to “robotize the person or its needs.” On the contrary, the goal was to give greater human needs greater humanity by improving the quality of life, which is exactly what Domus Salutis has been trying to do for years in the rehabilitation context. This humanization, while being among the preferred lines of research internationally, is not the only purpose explored in research. However, questions remain regarding the border between therapy and enhancement. Bissolotti explained the coevolution that is taking place between man and robot. This development demands that we ask how and in what way the thinking mind begins to resemble something other than itself, perhaps even machines as it seeks to compete in the evolutionary race. 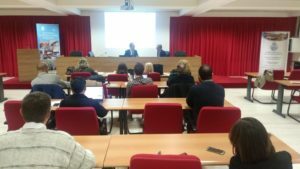 On Friday, December 14, Santiago Marcet, a collaborator of UNESCO Chair in Bioethics and Human Rights participated in the CONIUS Day on the initiative of the CONIUS Commission, with the organization of the Sapienza University’s Center for Eurosapienza and the UNESCO Chair “Population, Migrations and Development” as a continuation of the Symposium held in Florence last November. Enrico Vicenti, secretary general of the Italian National Commission of UNESCO opened the conference recalling the role and activities of the CNIU (Italian National Commission for UNESCO), as well as the genesis of the three Commissions in which the program of Italian Unesco Chairs was articulated in the last two years. He highlighted how the work of this Day is part of the celebrations of the 70th anniversary of the Universal Declaration of Human Rights, perhaps too much neglected by the media and public opinion. Those present then listened to the first of the reports of the Working Committees of the Italian Unesco Chairs. 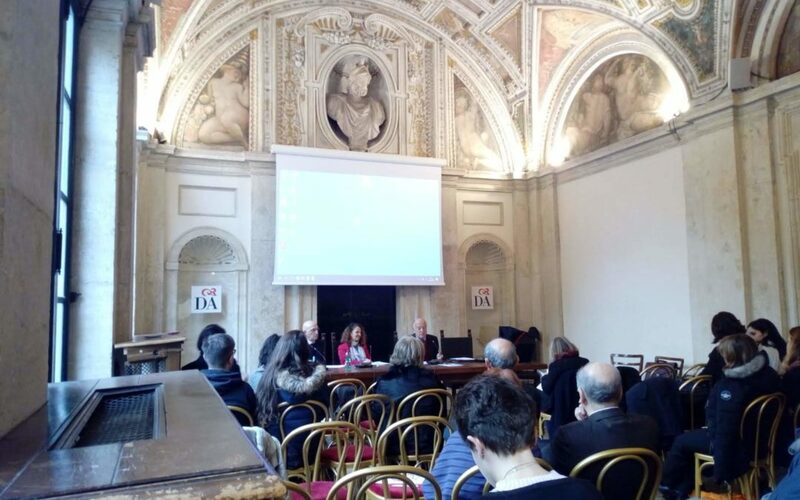 Professor Paolo Orefice continued explaining in detail the works of the recent Symposium in Florence, which is currently underway for the e-book and whose program has been widely disseminated among scholars and researchers of the Unesco Chairs system. 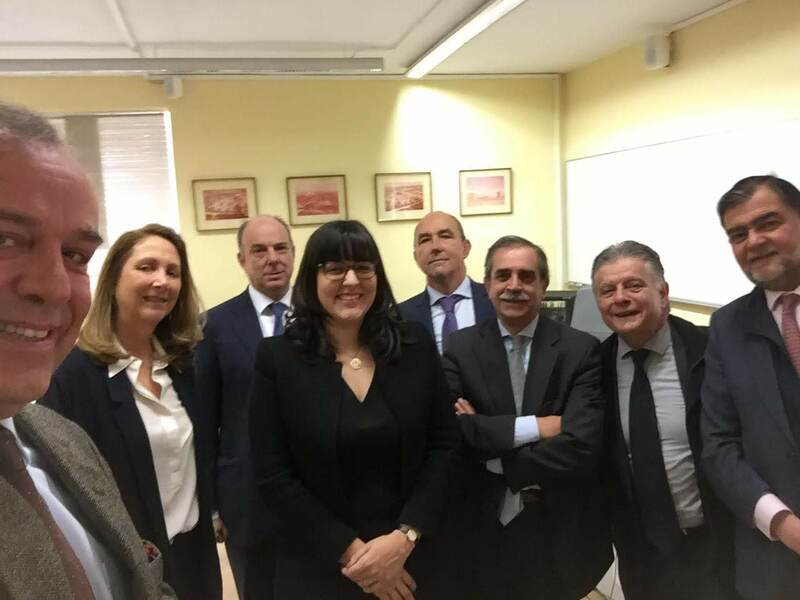 Dr. Martina Alemanno, who came to replace Enrico Giovanni from ASVIS, made a very interesting explanation about her agenda of goals set for 2030, and the various projects in which they are participating. Of particular interest to our Chair were their collaborations in various United Nations projects on early childhood education, for which they have translated European manuals for trainers. They have also developed a short sustainability training course. Most of the speeches focused on the importance of the Statement, its implementation in the various universities or institutions, and its importance as a reflection of the communicative effort of the various Chairs. Which, according to Prof. Paolo Ceccarelli, need to have more visibility and notoriety within the general scope of UNESCO, as well as a more direct communication with the core structure of the organization (as are other chairs in other parts of the world). 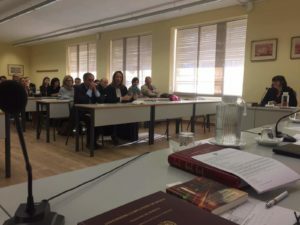 On December 14th, Prof. Alberto Garcia, our Director, in quality of member of the evaluation commission of the research work in the Faculty of Law of the Complutense University of Madrid, took part in Lorena Velasco Guerrero’ presentation of her 1100-page dissertation on “The concept of person in the Jurisprudence of the Constitutional Court.” She analyzed 36 years of resolutions of the Spanish Supreme Court on the concept of person, a fundamental concept in bioethical issues.